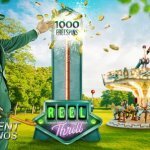 Another new NetEnt slot has been announced and I only have to see the preview video once to see that this new game is going to bring what the name already reveals, a lot of nudges! Not only nudges, though, as the game offers Re-spins as well and both seem to be great in combination with the 243 bet ways! Meanwhile, you’ll be taken into the deepest of the jungle. What do Temple of Nudges™ and Gonzo’s Quest™ have in common? 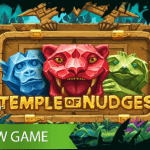 Before I even had a chance to find out what the gameplay of the Temple of Nudges™ slot was going to be about, the game reminded of another NetEnt slot. 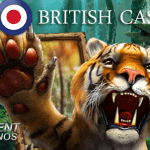 The sounds involved in this upcoming NetEnt slot and the way the symbols fall into place, did remind me of the Gonzo’s Quest™ slot. And I’m pretty sure I’m not the first to notice! Does this mean we have a sequel to Gonzo’s Quest™ or a game similar to Gonzo’s Quest? Not at all! If it comes to the style, yes, the two NetEnt slots do have a lot in common, but the gameplay is completely different. The Gonzo’s Quest™ slot is hard to beat with The Gonz as the most popular slot character and it was the first game that introduced the innovative Avalanche™ feature. However, we love nudges, right? 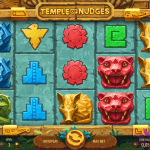 If not, I’m not sure if the Temple of Nudges™ slot is for you, but if you do, you have find yourself the perfect game! 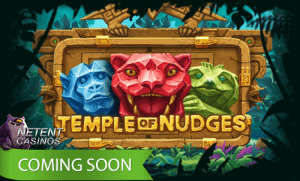 Watching the above preview video, you’ll soon notice that nudges is the keyword in the Temple of Nudges™ slot. Deep in the jungle, amidst the singing birds and where leaves sway in the wind, you’ll soon be surrounded by ancient symbols and stone figures. Not that special, I have to say, but I don’t think this game is designed to bring rich graphics. So obviously, it has to come from the gameplay but I have some troubles to figure out what exactly is going on. I do see five reels and three rows that offer the attractive 243 bet ways which means that all combinations from left to right count as a winning one. Until here it’s all very clear to me! Thanks to the name and game description, I do know that nudges is the keyword in this game and this is pretty clear when watching the preview video. Now there’s a Re-spin feature as well, but so far I didn’t succeed to find out when this second slot feature is activated. It took me a better look at the game description that I figured out that the activation of the nudges has something to do with the temple. If the temple activates, it alerts all life around with the sound of nudging, promising ancient gold to the travelers. The temple, on the other hand, is activated when a winning combination appears on the reels. We’re getting there! The nine ancient birds on the first three reels result in the temple to be activated and with that a nudge. It seems that nudges will keep coming as long winning combinations are created. It totally makes sense as well! As soon as I see a totally new winning combination involving the green stone figures, new nudges are activated. But that’s not all, it’s from this moment on that also the Re-spins make sense. A ribbon, in this case around a blue stone figure, is what activates the Re-spin figure. This might be completely random, but 100% sure I’ll be when the game is launched within a few months. 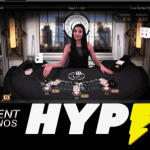 I’m very curious about what the combination of all these nudges and Re-spin will do for your casino balance, but to find out, we have to wait until the official game launch on the 21st of March 2019. 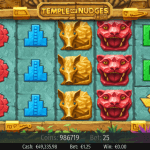 It won’t be a surprise that when the desktop version of Temple of Nudges™ is launched, that on the same day, a Touch® version will become available as well for those players that prefer to play their favourite NetEnt slots on either their mobile phone or tablet.